Based on Disney's epic animated musical adventure and Edgar Rice Burrough's Tarzan of the Apes, Tarzan features heart-pumping music by rock legend, Phil Collins, and a book by Tony Award-winning playwright, David Henry Hwang. 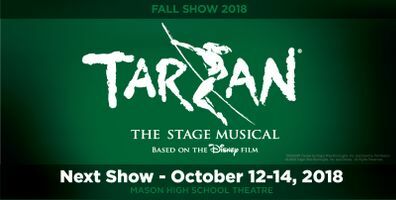 High-flying excitement and hits, like the Academy Award-winning "You'll Be in My Heart," as well as "Son of Man" and "Two Worlds," make Tarzan an unforgettable theatrical experience. Washed up on the shores of West Africa, an infant boy is taken in and raised by gorillas who name him Tarzan. Apart from striving for acceptance from his ape father, Tarzan's life is mostly monkey business until a human expedition treks into his tribe's territory, and he encounters creatures like himself for the first time. Tarzan struggles to navigate a jungle, thick with emotion, as he discovers his animal upbringing clashing with his human instincts.